We just played this ridiculously funny game after a pre-Christmas dinner gathering with a family group. We laughed ourselves silly. 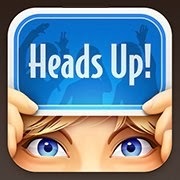 The Ellen Show watchers are likely familiar with Heads Up. It’s an application download for iPhones, which Ellen DeGeneres seems to enjoy playing on her TV talk show. The game is really simple. The Head's Up Party Game is sort of like a combination between Password and Catch Phrase, with a bit of 21st Century technology tossed into the mix. Someone is the guesser. That person holds an iPhone to his or her forehead, so everyone else can see the screen, but he or she cannot. In timed play, the Heads Up guesser tries to figure out what the mystery word or phrase is, while everyone else acts it out or offers clues. They’re not allowed to use the actual word in any form. Here’s a new twist. While folks are cuing the guesser with clues, they are being videotaped. That means their Heads Up antics may be saved for playback or online posting. Yep. Heads Up is silly, but it can be fun in the right company.